Idaho truly is one of the best kept secrets in upland bird hunting. Idaho is home to a variety of upland game birds. We have five species of grouse: Sage, ruffed, dusky (blue), spruce, and sharp-tailed. 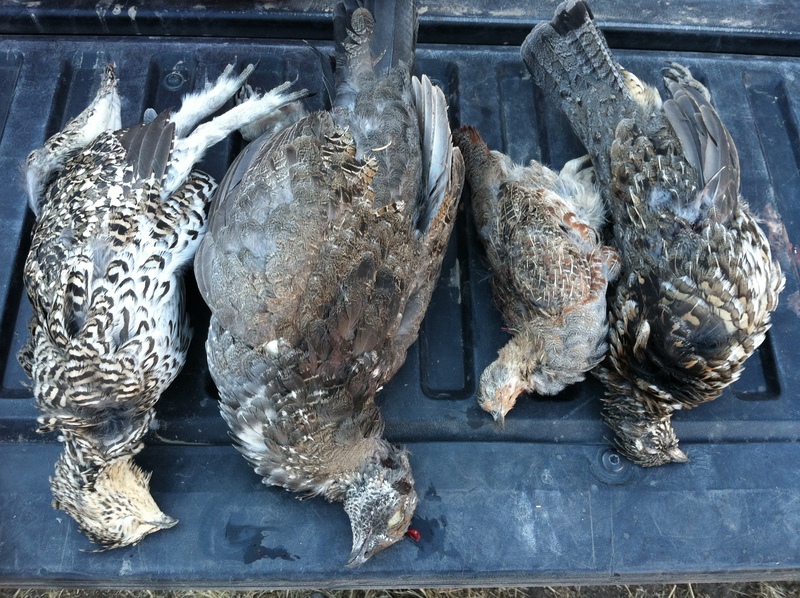 In addition, we have valley quail, Hungarian partridge, chukar partridge, and pheasants. With this variety, however, it is not common that you take more than one or two species in a day simply because of their differing habitats. 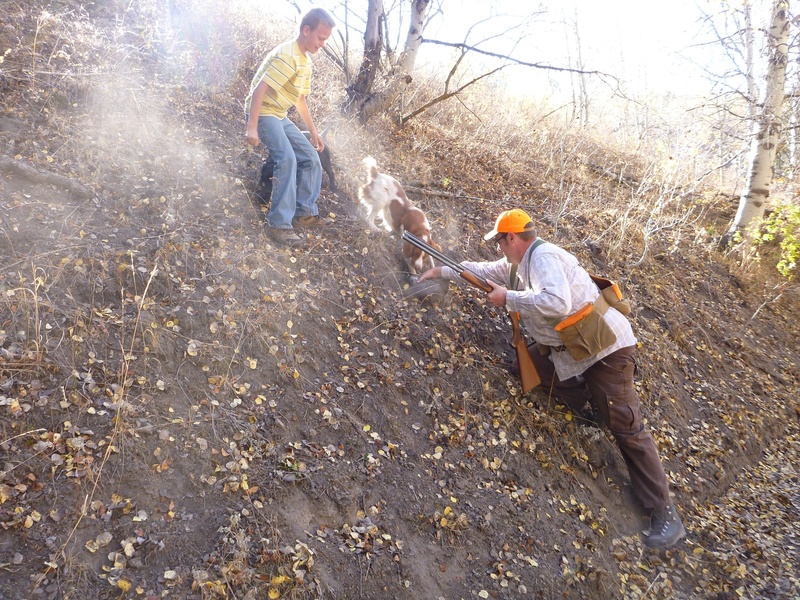 Every year, my brother Shawn comes for a week of hunting throughout southern Idaho and we live for this week in the uplands with family, friends and our dogs. The week this past October was one of our sweetest weeks ever. I wanted to share with you my favorite day of this eventful week as I accomplished something I never dreamed possible for me. Have you ever had one of those days where anything seems possible? In basketball, I’ve heard it described as the sensation that the net becomes bigger and bigger such that the shots from the player easily swish through the hoop. I recall watching my favorite player Karl Malone score over fifty points one night and it truly seemed that he could not miss. In bird hunting, I miss much more than I hit, but there are times when I shoot surprisingly well. 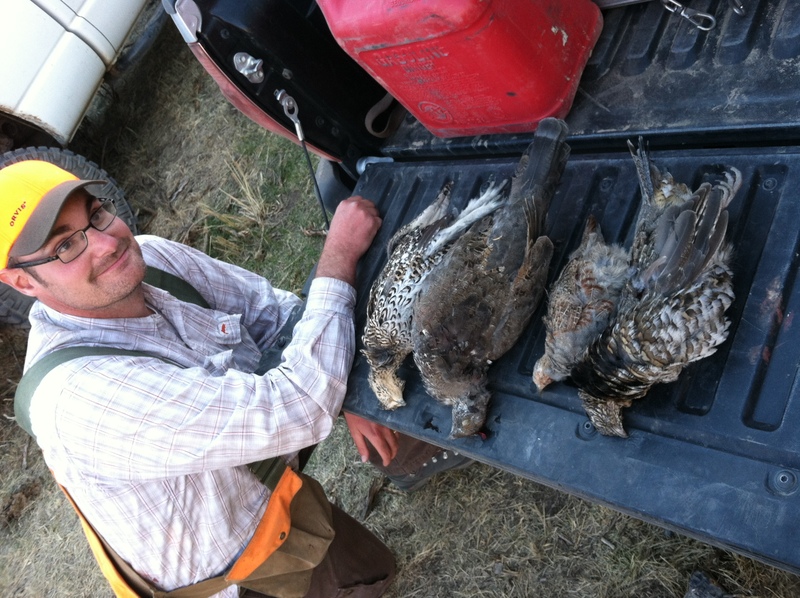 Tuesday, October 9th, 2012, was one of those days for me: I took four separate species of upland birds in one day. 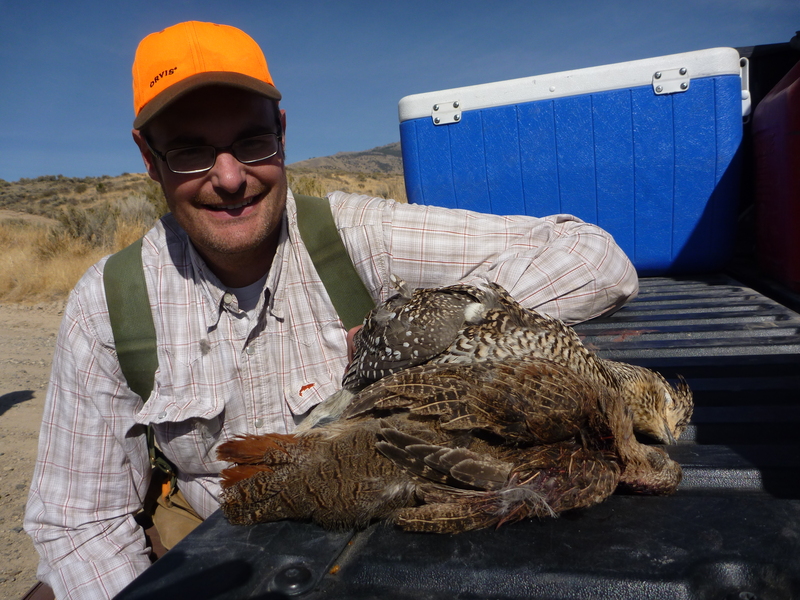 Idaho’s Fab Four, sharp-tailed grouse, blue grouse, Hungarian partridge and ruffed grouse. Along for the hunt that day were Shawn, his friend Sterling, our friend Troy, and his identical twin boys, Brigham and Wesley. Because Wednesday was the Idaho deer hunter opener, we decided that on Tuesday, we would hunt one of our favorite sharptail and Hun coverts, Tommy’s Covey, because we knew that it would be overrun by deer hunters the following day. This was an excellent call because the sharptails were abundant and, although noticeably less than the year before, the Huns were there in numbers that made things interesting. After our first hunt, Shawn had taken one Hun and two sharptails (which is the limit), Troy had his limit of sharptails, and I had only one sharptail. When I met up with Shawn, he said to me, “Andy, I found the mother load of sharptails. I got my limit. There were hundreds of them over in this draw. I wish you would have been there with me.” With such a report, I was intrigued. At the truck, we discussed going to Grouse Rock to hunt forest grouse, but I wanted to go after those sharptails that Shawn described to try and fill my limit. Everyone was agreeable to me walking this draw and Shawn told me right where to go. Sure enough, there were still lots of birds in the draw, but not on the sage hillside on the left as Shawn had told me. I only found one there, which I missed twice. The birds were on the right-hand side in the choke cherries. I missed another one that flew towards me and then up the draw. So that was four misses. As I observed birds coming out of the chokecherries, I felt this was the side to be on. I actually marked down where one had settled. Misty and I worked to that spot and sure enough the grouse flushed uphill quartering left to right and I thumped it. We ran uphill and found that the bird was just winged. Misty made an awesome retrieve, but then let it go and I had to catch it. So that filled my sharptail limit and it was my first limit of the year. To get back to the truck, I cut across the farmer’s cut field over into a draw I had previously hunted. In fact, I went right to where I had earlier marked down a covey of Huns, but could not find them. As I stepped near the edge of the deep draw, two Huns flushed. They were getting away quickly, but I thought I still had time and shot at the one on the left and, to my surprise, it dropped. Misty made an awesome retrieve of my fifth Hun ever. I’m starting to think these birds are not invincible. The first two birds of the quartet: a Hun and a sharptail taken from Tommy’s Covey. Back at the truck, we all decided to go after some forest grouse at a covert we call “Grouse Rock.” As soon as we hit the national forest along the dirt road, we observed a phenomena: It seemed that every forest grouse in the area, and there were plenty, was on or near the road. Of course, we stopped and walked them up and admittedly, I missed a few. We drove another hundred yards up the canyon and observed yet another ruffed grouse in a grassy opening on the left side of the road. Shawn stopped the truck and I jumped out and walked briskly toward the grouse and it headed for some thick timber. I was getting ready for a tough shot when another bird flushed behind me and I spun and dropped it. As I went over to pick it up, I saw that it was still alive and was trying to get away. “GET THE DOG!! !” I yelled. Meanwhile, back at the truck, the group observed it all and had a good laugh at my expense. Troy even laughingly proclaimed, “That was like watching Chris Farley hunting birds!” Admittedly, I do get intense. 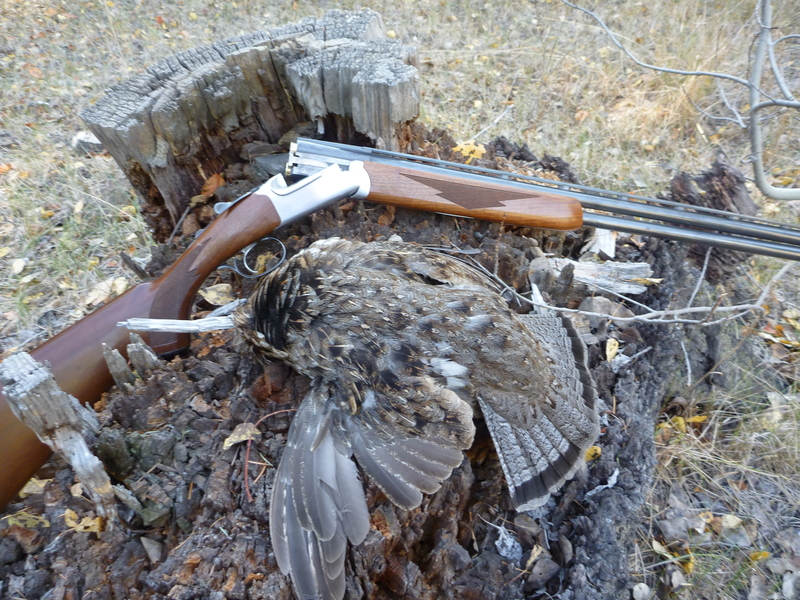 A gray-phased ruffed grouse taken by none other than Chris Farley. 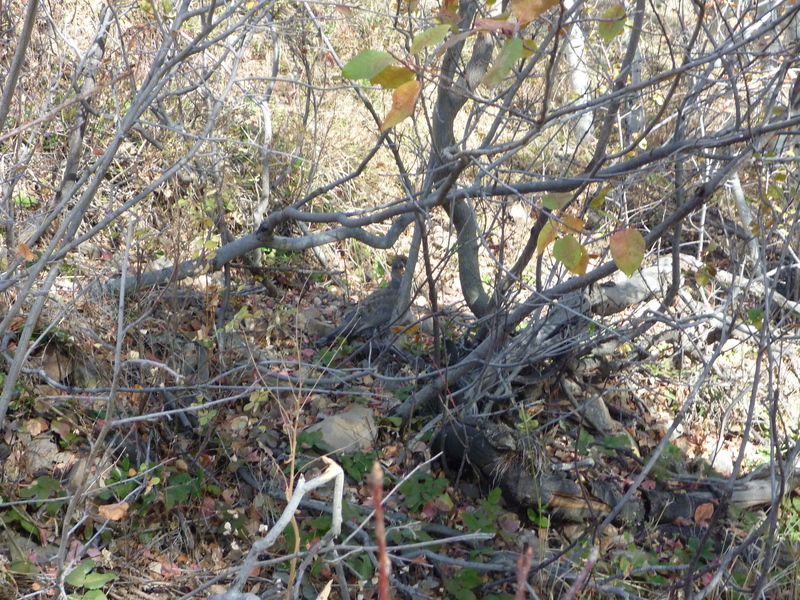 If you look closely, there is a blue grouse in that tangle. Only minutes later, we observed another bird on the narrow dirt road. Lo and behold, it was a blue grouse this time. “Go get him,” Shawn and Sterling said in unison. I got out the shotgun and chased that grouse up the hill on the right-hand side of the road where it stood still enough to pose for a picture. I could not get the darn bird to flush. Again, I hollered for the dogs and then I got above the bird and pushed it down hill. When I ran at it, it finally flushed. I missed it on the first shot, corrected and decked it on the second. Misty retrieved that one too. So that was four different species in one day. Perhaps we should call this accomplishment, “Idaho’ s Fab Four.” If I had set out to do this, I probably could not have gotten it done, but it was one of those charmed days. Misty delivers a nice big blue grouse, which was the last bird of the Fab Four. No doubt, four species in one day is something I will never forget. However, that afternoon I went on to accomplish another first-time feat. At the time I took four species, we hadn’t even yet made it to our destination covert, Grouse Rock. I am happy to report that just like the first day we discovered this cherished covert, Grouse Rock was loaded with ruffed and blue grouse and I harvested the limit of four forest grouse for the first time ever. Yep, it was one of those days that bird hunters live for! Man, I love Idaho! A proud hunter poses before Idaho’s Fab Four. Heck of a day!